Long before Rosé All Day was a hashtag, innovative Champagne producer Madame Clicquot made the first commercial pink bubbly. Abandoning the practice of adding a mixture of elderberries to impart a pinkish hue to the sparkling wines from Champagne, she developed a blend of white and red wine to produce the base wine for a new style of rosé. By combining still white wine and still red wines before the secondary fermentation in the bottle that produces the bubbles, she was able to produce a complex and fruity sparkling wine with a distinctive coppery colour. She is widely quoted as saying at the time: “Our wines must be flattering both on the palate and on the eye.” Two hundred years later, Madame Clicquot’s recipe remains the standard method for producing rosé champagne. 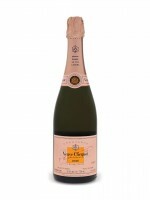 Veuve Clicquot Rosé Champagne is based on the traditional blend for the well-known Brut Yellow Label Champagne with the addition of 12 percent red wine (Pinot Noir from the producer’s best vineyard, Clos Colin, in Bouzy) for colour and more fruity, red berry flavours. This is refreshing and delicious. A sparkling wine flavourful enough for toasting or to enjoy with a meal.